Wow! What a great class for you foodies out there! Yet another fantastic free initiative put on by the Marbella Town Hall. 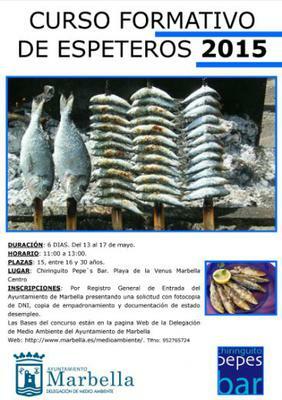 The Town Hall of Marbella delegation of beaches in collaboration with the Association of entrepreneurs from beaches through the bar Pepe´s Bar on the beach of Venus, will carry out a training course for culinary speciality in Espeteros. So don't miss this traditional culinary practice of the Costa del Sol in new generations offered free of charge, without any registration fee, said training course between people registered in Marbella. The number of seats for participants is limited to 15 people, in State of unemployment and between 16 and 30 years. The course consists of a theoretical part and part practical, and at the end of the course will be a contest of skewers where there will be a jury formed by 5 specialists. It will be issued a certificate of participation at the end of the course, being mandatory to obtain the same assistance. The course will last for 6 days, from Wednesday 13 to Sunday 17 may and 11:00 h to 13:00 hours. Registration application must present in the check of the Council with photocopy of ID, copy of registration and documentation of State in unemployment. The first 15 applications that meet the requirements will be accepted in order of presentation.